Wilfrid Laurier University is saddened by the death of Professor Emeritus Paul Heyer, an internationally-recognized communication studies scholar. Heyer was a polymath, earning degrees in geography, sociology and a PhD in anthropology from Rutgers University before going on to make significant contributions to communication studies, which he taught at Laurier since January 2001. 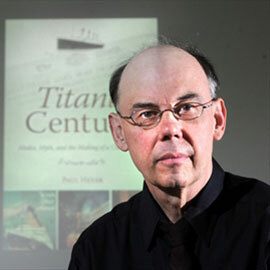 His published research includes significant studies of the works of Orson Welles and Harold Innis, the popular and influential book Titanic Century: Media, Myth and the Making of a Cultural Icon and seven editions of the most widely-adopted introductory media history textbook in North America, Communication in History (co-edited with David Crowley and, in the last edition, Peter Urquhart). In addition, Heyer published work on digital cinema and opera, the legacy of Marshall McLuhan and taught courses on film comedy, non-verbal communication, the culture of the 1950s, and radio, among many, many others. Just this summer his magnum opus on desert island narratives, Islands in the Screen: From Robinson Crusoe to Lost, was submitted for publication and is expected to be published posthumously. As well as a highly accomplished scholar and popular undergraduate teacher, Heyer was a beloved and extraordinarily generous colleague and mentor. Perhaps his greatest contribution, though, was to graduate student teaching, supervising and mentorship. Over his career, Heyer supervised dozens of students to MA and PhD degrees and was instrumental in establishing the MA program in Communication Studies at Laurier, where he was a fixture, teaching the required seminar, even after his retirement in 2016. Laurier’s Department of Communication Studies is looking into ways to permanently honour Heyer’s legacy.